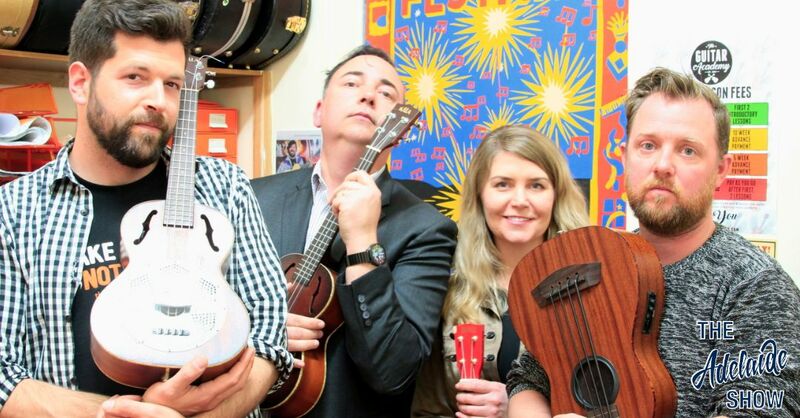 This week’s episode of The Adelaide Show, is all about the ukulele with the Ukulele Death Squad. And Lisa Kennewell is standing in for Nigel Dobson-Keeffe this week. This week, the SA Drink Of The Week is from Sunlight Liquor. And our song of the week is from, guess who? Steve has finally registered his Fringe show, 2 Cats On A Hot Fringe Roof. Sunlight Liquor … tasting notes. They want to make ethical beverages from pure ingredients. Honey is an amazing product, it is the nectar of flowers collected and concentrated by the honey bee. Each different flower has its own unique flavour, no two honeys are truly alike. Sunlight Liquor is dedicated to bringing mead from its ancient roots into the modern world. We make a lighter, sparkling drink with subtle honey flavour, a drink that balances sweet and dry. The Ukulele Death Squad is touring the world’s most dangerous Ukulele show around Australia this September and October celebrating the release of their new single, Not Afraid. Despite the danger, we’re not afraid to have them on The Adelaide Show! Read Steve’s review of the Ukulele Death Squad in concert, at Elder Hall, Adelaide. How could a ukulele show possibly be dangerous? What’s the difference between a small guitar and a uke? What kind of wood are ukes made from? Which country makes the most ukes? What song completely changes its mojo when played on a uke? Are ukes ever played as part of an orchestra? Hip hop? I know you love to have fun with re-appropriated pop songs to the sound of the uke, but do you also compose your own songs? Who are you inspired or influenced by? Do you listen to twang such as 16 Horsepower? What makes you the most dangerous uke group in the world? Do you have any uke tattoos? We’re any of you part of the world uke record in Hong Kong in 2017 or Tahiti in 2015? Or Adelaide’s own Guinness World record attempt in the summer of 2016? Does it take a special kind of personality to play the uke? Who’s your favourite celebrity uke player? Our song this week is Not Afraid by the Ukulele Death Squad.